eD@HoMe: Back after a long pause! Hi guys, I am back! Lots of covers received during this absence and lots of catch up to do! 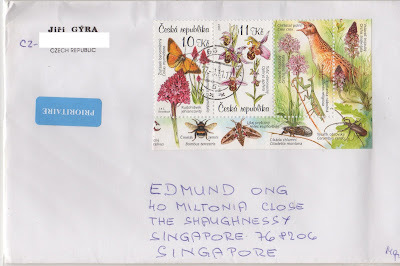 Firstly, I would like to thanks Joze Kastelic for this beautiful Insects cover posted from Slovenia. In fact it is only my second cover from this beautiful country. 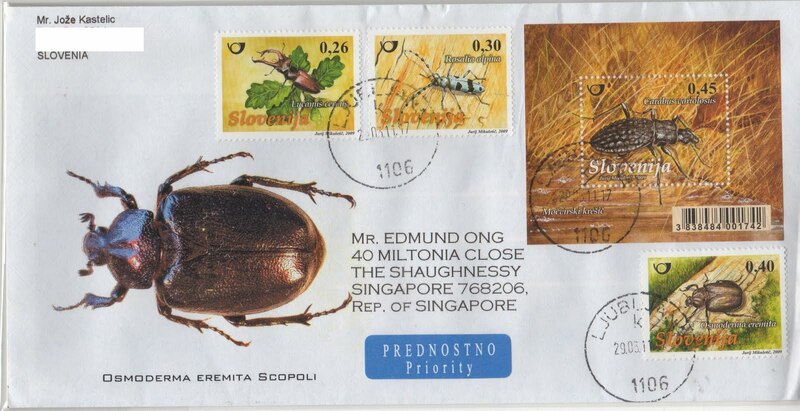 Issued on 25th Sept 2009, the stamps depict a Stag Beetle (0,26), Rosalia Longicorn (0,30), Hermit Beetle (0,40) & Ground Beetle (0,45). 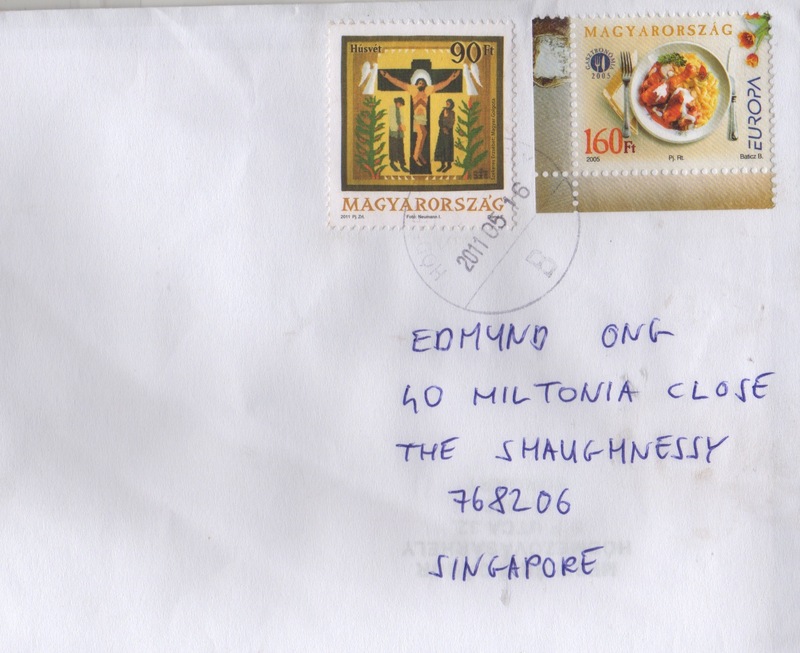 The second cover was posted from Slovakia. Many thanks to Robert Brnka once again! The stamps belong to the Cultural Heritage of Slovakia series, featuring The Church of St Georg in St Jur (issued on 28th Jan 2011), International Year of Chemistry (17th Jan 2011) & 20th Anniversary of the Foundation of the Visegrad Group (11 Feb 2011) respectively. To celebrate the new Millennium, Canadian Post in 1999, issued a set of 3 stamps designed to, "bid farewell to the second millennium and usher in the third, paying home-age to printers, who began producing stamps in the 19th century and now stand poised to take postage into the twenty-first". 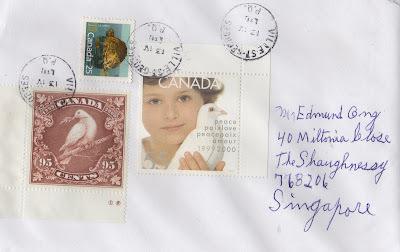 All 3 stamps featured the dove of peace, but each was created to celebrate a different printing technique: the 55c denomination (extreme right stamp on the cover) used Lithography (the most common technique today), the 46c stamp a 'futuristic' hologram and the 95c stamp (first stamp from the left) utlilized the dying art of engraving. To make up for the postage, Georges Ed. Pomerleau used a Beaver stamp, issued in 1988. Thank you very much! 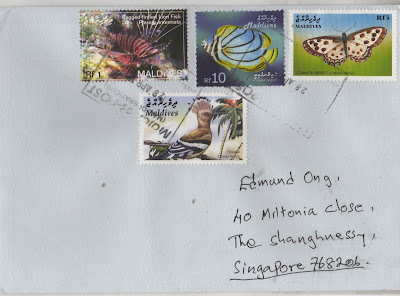 Next, is a very colourful cover posted from the Maldives! Thanks very much to Clarence George. The stamps feature native animals such as Bagged finned Lion fish, Chaetodon, Common Pierrot & Hoopee Upupa epops. In keeping with its traditions Magyar (Hungary) Posta in 2011 released a new postage stamp to send greetings at Easter (first stamp on the cover). The stamp design uses a reproduction of a work by the textile artist Erzsebet Szekeres entitled Hungarian Golgotha. 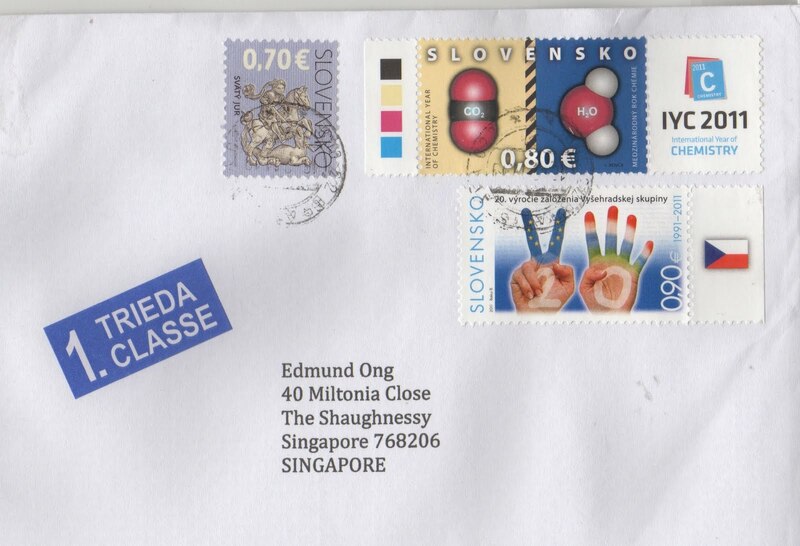 The other stamp belongs to the Europa Gastronomy series (2005). Gastronomy is the art and science of good eating. Thank you very much to Meszlenyi Gabor for this awesome cover! The next beautiful Czech cover was posted by Jiri Gyra. Thank you!! It features half a miniature sheet from the Nature Conservation: The Lower Moravia - UNESCO Biospheric Reservation series, issued on 5th Sept 2007. 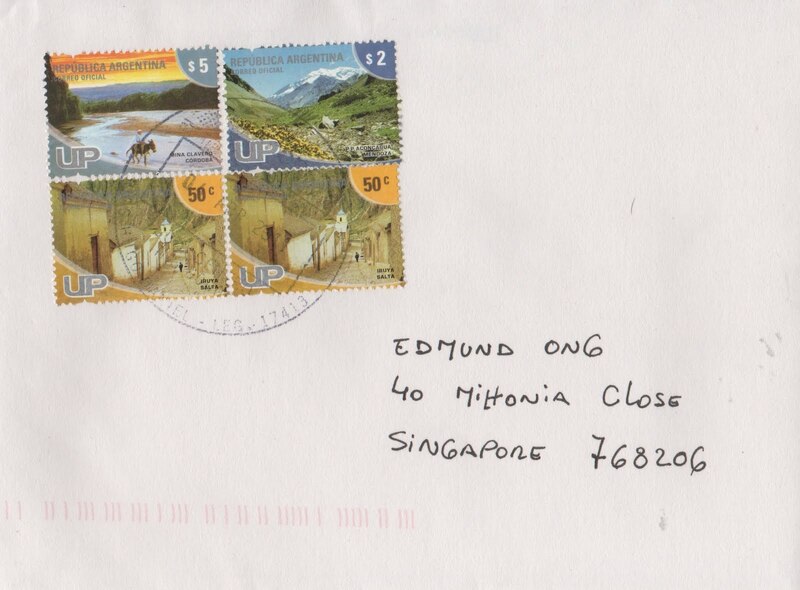 Last but not least, Viviana sent me another lovely cover from Buenos Aires, Argentina. Greatly appreciated my friend! 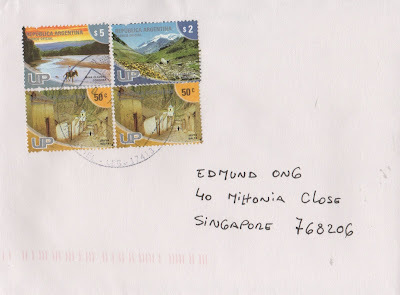 Issued on 24th Sept 2008, the four stamps are part of a set of seven stamps featuring some typical landscape of different region of Argentina. That's all for this post. Talk to you guys soon.